Megadeth performed on NBC-TV’s Late Night With Seth Meyers on December 15 and video from the program is available. 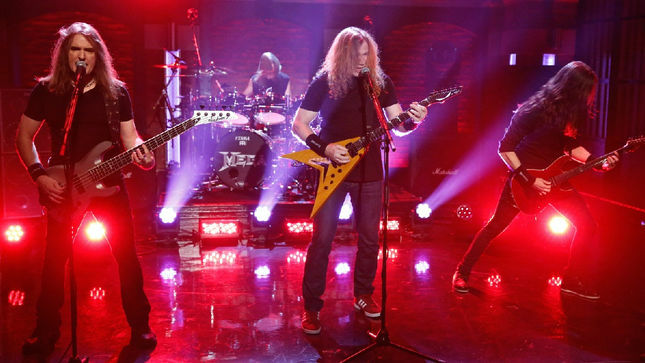 The Late Night appearance came a few days after Megadeth played a secret show at the Saint Vitus bar in Brooklyn. Billed as Vic & The Rattleheads – named after their mascot – the band delivered an 8-song set of classics in the intimate venue. Megadeth’s fifteenth album, “Dystopia” debuted at No.3 on the US Billboard 200 with opening week sales of 49,000 equivalent album units earlier this year. The feat marks the group’s highest-charting US album since 1992’s “Countdown To Extinction”, which debuted and peaked at No. 2.